For one hundred years, life in one of the most beautiful landscapes in Thuringia had been influenced by the dirt and the rhythm of the steelworks at Maxhuette Unterwellenborn. Filming daily life in this region was a challenge for the filmmakers who made their first film here in 1986. In the spring of 1993, three and a half years after the fall of the Berlin Wall, the fifth, and last, part of the Maxhuetten chronicle was filmed. A strange atmosphere, a sense of catastrophe and new beginnings, ruptures and new starts pervaded the region. 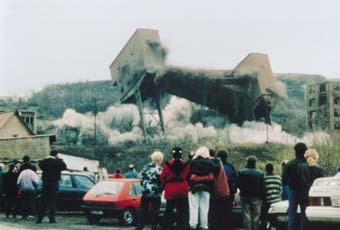 Three years after filming began, the Maxhuette steelworks, so rich in tradition, were closed down. During these three years, the filmakers observed the people who worked there. This impressive and critical film will preserve memories of the Maxhuette steelworks and all its former workers. Joachim Tschirner was born in Wittenberge in 1948. He studied Aesthetics and Cultural Theory and began working at the DEFA Studio for Documentary Films in 1975, making his first film in 1980. His documentaries include: Say: Heaven. Even When There\'s None (1984), Canto General: The Great Song of Pablo Neruda and Mikis Theodorakis (1983), At the End, the Concert (1985), A Small Piece of Germany (1991, with Klaus Salge & Lew Hohmann), Kein Abschied - nur fort (1991, with Lew Hohmann), Maxhuette-Cycle (1987-1991), On the Seventh Day Over the Syr Darja (1992-1995), Sieben Tage - Da unten am Indian River (1995), Tapping (1993-1997), The Aral Sea - Where the Water Ends, the World Ends (1998), and Yellow Cake (2005-2010). Burghard Drachsel was born in Rostock in 1949 and studied Aesthetics and Cultural Theory. His films include: Stahlwerk Thueringen (1995), Kiez-Geschichten: Am Oranienburger Tor (1997) and Tapping (Abstich, co-dir with Joachim Tschirner, 1993-1997).